We move west to identify three Midwestern community banks with decent yields and incremental growth opportunities for income-oriented investors. We also briefly discuss two Indiana community banks which didn't make our cut for income-oriented investors. Prospective investors will want to consider the unique merits of each company in making investment decisions. Our survey of the vast community banking sector often turns up companies which, while not fitting our growth and value criteria to be considered top tier opportunities, are nonetheless potentially intriguing for more conservative income-oriented investors seeking the added potential of incremental appreciation. In this article, we move into the Midwest to highlight three institutions which fit this description. Community banks are an often overlooked opportunity for consistent and generally reliable dividend income. The dividend yields are not as high as those in the typical income-oriented articles in this forum which often focus on limited partnerships, real estate investment trusts, and similar income driven business models, but are arguably more secure in the long term notwithstanding severe financial crises. In addition, relative to larger money center and regional banks which also tend to have decent dividend yields, strong community banks are somewhat less volatile and sensitive to changes in macroeconomic trends and broad market sentiment. Of course, that said, this depends on acquiring shares at a reasonable valuation. The added benefit of an acquisition in the consolidating banking sector, even if remote, adds to the overall appeal for those seeking consistent income coupled with incremental growth. We should note that all the banks presented here are small capitalization companies and sometimes trade in small blocks. Eastern Michigan Financial and Northeast Indiana both have market capitalizations of less than $50 million, while Kentucky Bancshares has a market capitalization of $150 million and LCNB has a market capitalization of $210 million. However, each bank trades occasionally in larger blocks and are sufficiently liquid to appeal to long-term investors. 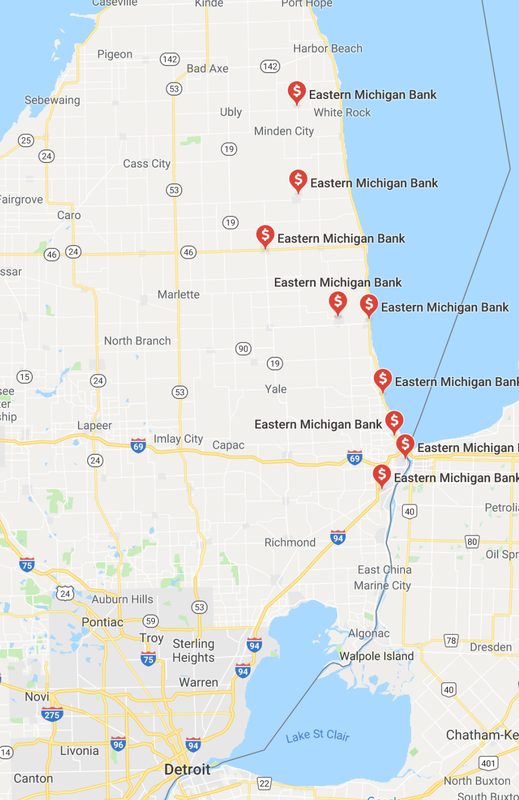 Eastern Michigan Financial Corporation is the parent of Eastern Michigan Bank, a nine-branch bank primarily serving Sanilac and St. Clair counties in eastern Michigan north of Detroit along Lake Huron. Eastern Michigan Bank is the largest local community bank in its primary markets despite holding just under a 10% insured deposit market share. The company’s primary competitors are all larger national banks despite the rather rural nature of the bank’s market area. The company’s attractive features include its record of consistent earnings, conservative loan underwriting, and modest valuation relative to book value and earnings. The company has been profitable every year since the financial crisis and, notably, also remained profitable during the financial crisis even as provisions for loan losses rose significantly during the worst years. As a result, the company did not need to issue preferred stock to support its capital base, instead reducing its loan portfolio by more than 20% between 2008 and 2013. In the process, book value continued to grow during the financial crisis while the company maintained a consistent number of outstanding common shares. The company's performance during the financial crisis reflects the conservative nature of the company’s loan portfolio. 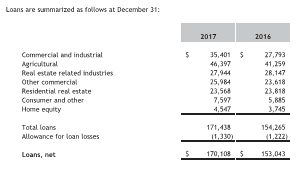 The company’s nonaccrual and past due loans as of the end of the most recent year totaled $2.2 million – down 33% from the prior year – while agricultural credits represented more than half of the balance. The size of the bank does result in larger than average exposure to individual credits resulting in a history of careful credit management. In addition, the company’s net interest margin exposure to rising interest rates is mitigated by a relatively shorter maturity and repricing schedule for its investment security and loan portfolios based on data from the Federal Financial Institutions Examination Council. The company’s interest bearing deposit base is roughly evenly distributed between demand, money market, savings, and time deposits, while non-interest bearing deposits represent a respectable 27% of total deposits. The company’s earnings exposure to changes in interest rates is therefore limited, boosting support of the dividend. The company did not escape the financial crisis entirely. In 2009, the company cut its dividend in half from $0.96 to $0.48 which will warrant consideration by income-oriented investors. The company has since increased the dividend in the last two years (in addition to the current year) to yield 2.8%. However, before the financial crisis, the company’s payout ratio approached 45%. In the event the company returned over time to this level, it would imply a dividend of about $1.09 per share on current year earnings and a dividend yield approaching 4.5%. Eastern Michigan’s valuation is modest at around 11 times forward earnings and 0.9 times book value. The company’s return on equity is somewhat low, averaging 8.7%, resulting in the discount to book value. However, the bank has historically achieved returns on equity closer to 10% and a return to these levels should modestly boost the share value. Regardless, for those seeking current income in combination with the potential for incremental growth, Eastern Michigan’s consistent profitability should generate average total annual returns over time in the range of 8% to 10% as earnings boost book value, in turn boosting earnings, etc. Eastern Michigan is therefore a solid, consistent, and profitable bank that, while offering modest growth potential, nonetheless provides a secure and rising dividend yield. 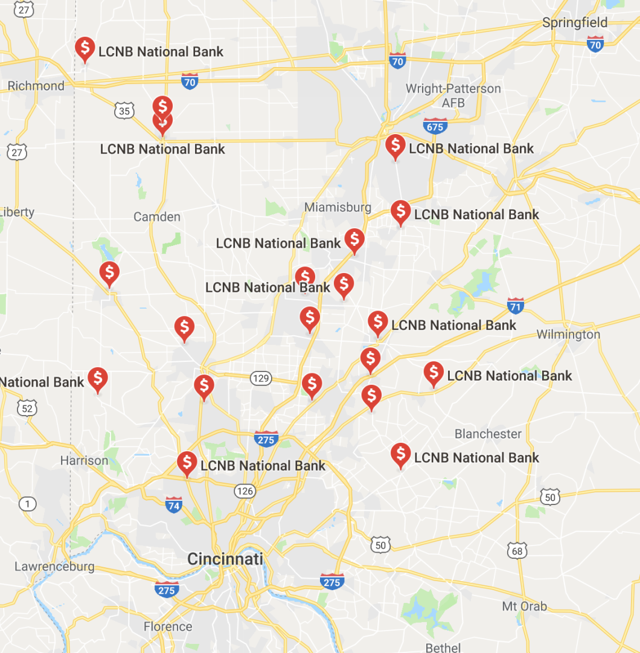 LCNB is the holding company for LCNB National Bank, a 34-branch community bank primarily serving the region between Cincinnati and Dayton, Ohio, although the bank also has locations in Columbus and Chillicothe in central Ohio. The company’s geographic region has a wide distribution of growth rates, using population as a proxy, with some more rural counties experiencing slow or flat growth while the company’s more urban and suburban markets are typically experiencing faster population growth. LCNB is somewhat different from the type of bank that we would typically recommend in that a significant portion of the company’s growth is based on acquisitions of smaller competitors in its market areas. Indeed, the bank has made acquisitions in four of the last five years, taking advantage of opportunities to consolidate and expand its branch footprint in core and adjacent markets. The trend strongly suggests that the company will continue on its acquisitive trajectory and, in this respect, Ohio is a good market for this approach as the state has a large number of small community banks. A stolid Midwestern bank, the company does have some drawbacks. The allowance for loan losses, while roughly 140% of the company’s past due and nonaccrual loans, is an unusually low 0.4% of total loans. The company’s charge-offs have been similarly low over the last few years, perhaps justifying the allowance level, but a deterioration in credit quality would disproportionately impact the bank's earnings in the short term. The provision required to bring the allowance for loan losses to a more typical 1.0% of total loans would be about $7.5 million pre-tax or about $6.2 million after tax. However, the accrual of this amount would not push the company into the red for the year, reducing earnings per share by around a third ($0.45 per share), so the company clearly has capacity to absorb additional losses should it become necessary. LCNB’s dividend, unlike those of Eastern Michigan or Kentucky Bancshares, has been stable over the last several years at $0.64 per share for a current yield of 4.3%. The payout ratio is also rather high at about 53% of current year projected earnings adjusted for merger related expenses. LCNB’s valuation, though, is relatively modest at about 13 times current year earnings per share and 1.0 times book value (about 1.3 times tangible book value). The company’s return on assets and return on equity are also modest, averaging about 0.95% and 8.5%, respectively, over the last several years. The company’s investment securities and loan portfolios are longer in scheduled maturity and/or repricing than we would generally prefer, but these factors are meaningfully offset by the company’s non-interest bearing deposits (just over a respectable 24% of total deposits) and large deposit base in lower cost savings accounts versus higher cost time deposits (which represent only 22.5% of the deposit base). In addition, net interest margin has expanded slightly in the current year as investment securities have been displaced by additional higher yielding loans in the interest earning asset portfolio. Ultimately, we expect the net interest margin to decline slightly on rising interest rates but expect the impact on earnings to be moderate. We therefore included LCNB in our list of suggested income oriented options based on the robust yield, modest valuation, and relative resistance to changes in interest rates. Kentucky Bancshares is the holding company for Kentucky Bank, a 17-branch bank generally serving Lexington, Kentucky, and the surrounding counties. The company’s primary market is Bourbon County, located to the northeast of Lexington, where the company holds more than half of insured deposits, according to the Federal Deposit Insurance Corporation. The company’s geographic market is a mixture of moderate and low population growth regions, although the Lexington, Kentucky, metropolitan statistical area has experienced consistent population growth over the last several decades. A final attraction is the company’s high proportion of recurring non-interest income. Income from sources such as brokerage fees, deposit fees, interchange fees, loan servicing fees, and trust department income are nearly a quarter of total net interest and non-interest income. The non-interest income sources help to further mitigate the impact of changes in net interest margins. The company’s current yield of 2.5% is below our long-term expectations. The company has increased the dividend annually over the last several years and, until 2017, maintained a dividend payout ratio of about 40%. However, this ratio has declined, especially with the advent of tax reform, and the company has increased the annual dividend growth rate from about 4% to 7%. In the event the company again reaches a 40% payout ratio, dividends could amount to $1.65 per share, a 3.3% yield at the current share price. The company’s operating performance has left a bit to be desired in that return on assets and equity have tended to be slightly below 1% and 10%, respectively, although the benefits of corporate tax reform should boost these to around 1.2% and 12% in the current year. Similarly, the company’s valuation is on the higher end versus the other banks presented in this article, trading at about 12 times forward earnings but 1.5 times book value. 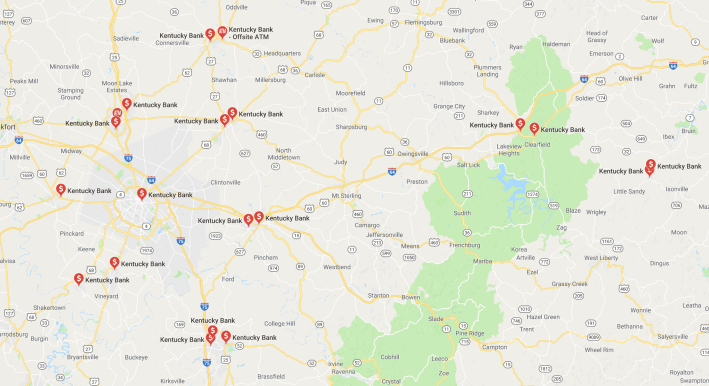 Kentucky Bancshares is not the least expensive selection of our three banks, but, given the company’s consistent growth in book value, the valuation is not excessive. In consolidating our thoughts on banks in the Midwest region to recommend for income-oriented investors seeking incremental growth opportunities, we also considered two Indiana banks – NorthWest Indiana Bancorp (OTCPK:NWIN) and Northeast Indiana Bancorp (OTCQB:NIDB). However, we ultimately determined that we could not recommend these banks despite their decent dividend yields – 2.7% and 2.6% respectively – due to their higher exposure to changes in benchmark interest rates, larger concentrations in fixed rate residential lending, and in the case of NorthWest Indiana, a higher than preferred relative valuation. Nonetheless, of the two banks, Northeast Indiana Bancorp, which serves the upper northeastern quarter of Indiana, may still be interesting to income-oriented investors willing to accept a higher degree of interest rate risk exposure. The company has a trend of annual special dividends which in the current year have pushed the effective dividend yield closer to 4.5%. The risk, of course, is that these special dividends could decline or disappear entirely in the event rising benchmark rates erode the company’s net interest margin. The bank’s valuation is also not excessive at about 12 times earnings and 1.2 times book value, though this valuation, in our view, reflects the company’s higher exposure to rising interest rates. However, being more highly sensitive to changes in benchmark interest rates as a more traditional savings bank, we can’t recommend the bank over the others described in this article due to the risk associated with declining special dividends as rising rates take an incremental toll on the company. Disclosure: I/we have no positions in any stocks mentioned, but may initiate a long position in LCNB over the next 72 hours. I wrote this article myself, and it expresses my own opinions. I am not receiving compensation for it (other than from Seeking Alpha). I have no business relationship with any company whose stock is mentioned in this article.